We distribute a number of accessories for shaft mount reducers to increase adaptability, generate longer life and save you costs. 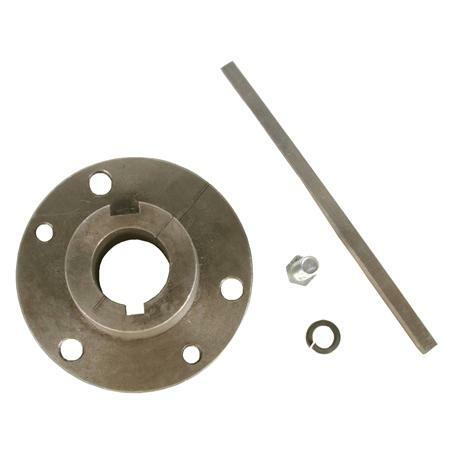 The accessories we carry include backstop assemblies, motor mounts, belt guards, tapered bushing kits, torque arms, “Original” rebuild kits, “Ultimate” screw conveyor flanges & shafts. Equivalent in dimensions to the popular TXT = SMR reducer series, our shaft mount speed reducers are standard in the industry. Allow for the transmission of power to conveyors with specs including 9:1 to 25:1 ratios, 1-15/16” to 5-7/16” hollow output bores, metal reinforced double lip spring loaded oil seals, all-cast iron housings, and 2-3 year warranties between our “Original” and “Ultimate” SMRs.SMR 2 year warranty. Designed for OEMs with a stronger cast-iron casing, increased mounting options and an extended three-year warranty, our “Ultimate” shaft mount reducer is the best choice for screw conveying applications and all other shaft mount applications requiring a more rugged design. For this reducer, we offer industry standard CEMA screw conveyor flanges and drive shafts for output bore sizes ranging from 1-15/16” to 3-7/16”, in speed ratios of 9:1,15:1, and 25:1. This reducer is also available in bore sizes 3-15/16” through 4-15/16” for non-screw conveying applications in speed ratios of 15:1 and 25:1. The “Ultimate” provides exceptional reliability backed by a WSMR 3-year warranty.